Castleford's Matt Cook in action at Huddersfield. The Tigers will take to the Mend-A-Hose Jungle pitch tonight without eight first team stars as they take on a Wakefield Trinity side that have also been hit by injuries to their first choice half-backs. Cas hope to have Nathan Massey back after injury, but have lost in-form forwards Matt Cook and Grant Millington to knocks picked up in last week’s narrow defeat to Huddersfield Giants. They join Jordan Rankin, Alex Foster, Chris Clarkson and long term injury victims Luke Gale and Jamie Ellis in missing the game along with key organiser Paul McShane, who sits out the last game in his three match suspension. 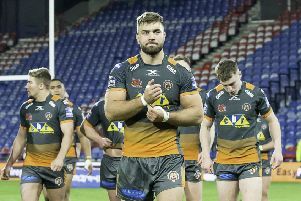 The number of players sat on the sidelines instead of playing is a growing problem in Super League and Tigers boss Powell believes it is down in part to the scheduling of matches. Having two games in such a short space of time over Easter does not help – Cas are also in action away to Catalans Dragons on Monday – and Powell would like the Rugby League to look into the short turnarounds between matches. He said: “We are doing it tough. There are a few teams like us and it’s not an excuse, but where we are with injuries at the moment, it is pretty tough. So far, this year feels a bit like 2016 with the amount of injuries we’ve had. “There is a lot of it about and the scheduling of games is not making it easier. There’s a lot of short turnarounds with Thursday night games and that makes it harder. “There’s a significant amount of injuries at the minute at all clubs, the sport is getting tougher and I think something needs to be looked at with the scheduling. Powell is expecting a physical threat from the visitors in tonight’s derby tussle with Trinity’s pack including some big men, including current Man of Steel points leader David Fifita. More than just bragging rights are at stake with the winners going third. Both have picked up six victories so far and are separated by just two in the points difference column. Powell added: “We started the season really well and Wakefield started poorly. They had a really good spell last month and they are going well, though they picked up a couple of injuries last week as well. “It is an important game. Easter is always important – you’ve got two games in a really short space of time and you can win both and be flying or it can go the other way and things can be tough.